2016 marked 90 years of Ducati: a brand which is globally loved and dreamed off. In the midst of high performance superbikes, Ducati has brought back the 70’s style and charm with the all new Scrambler. 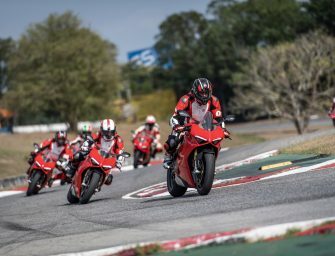 Ducati has a bike for all; and with the newly launched XDiavel, they offer bikes for all categories of riders across varying price range. To begin with, Scrambler is a retro-styled bike built for off-road and street use. During the 50s and 60s, the term “scrambler” was used to describe a street bike with off-road potential. Scrambler is a healthy mix of a retro/old bike with a higher than average riding height and shocks and dirt tires, stripped down to the bare essentials in today’s custom bike world. 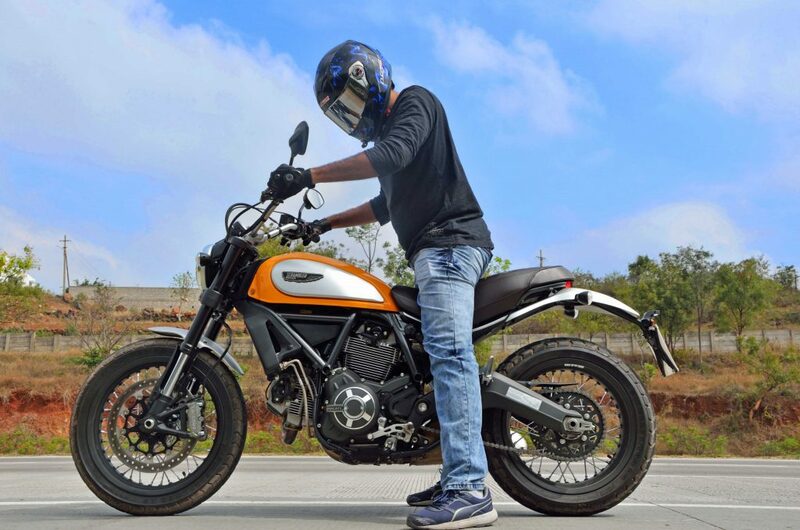 Ducati Scrambler: The head turner! 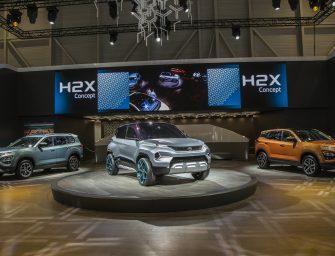 There are four versions – the Icon, Classic, Urban Enduro and Full Throttle – with each offering their own paint jobs and a few styling elements, such as headlight grills, sump guards, different wheels, mudguard and seat options, and different exhausts too. 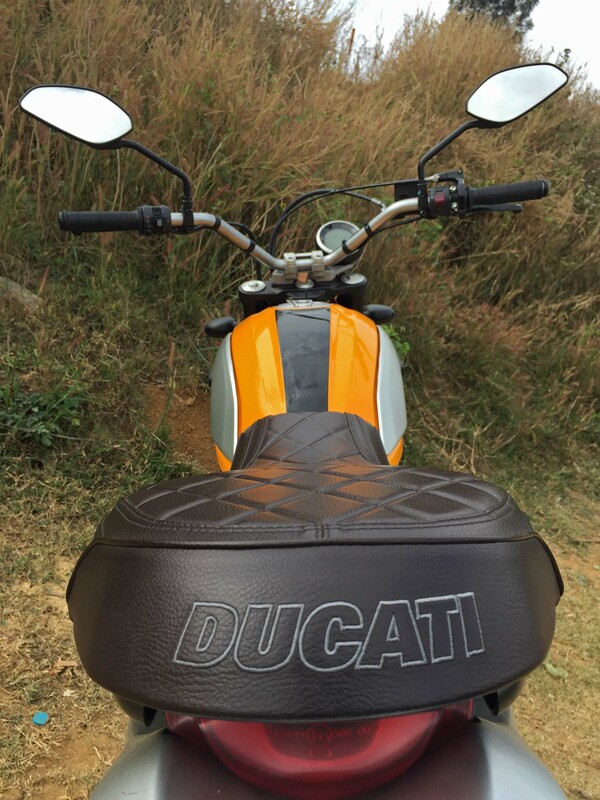 We rode the Scrambler Classic around Bengaluru which came with a classic styled leather seat. The concept of the bike is a born-free style inspired from the old Scramblers mixed together with modern touches to meet the demands. The Scrambler comes with a plain round headlamp with LED DRLs around it. The exposed cables on the Scrambler certainly add the classic feel and the wide handle bars and bench seat offers a great relaxed upright riding position. There is an LCD display which shows all information except the most needed fuel gauge notification. 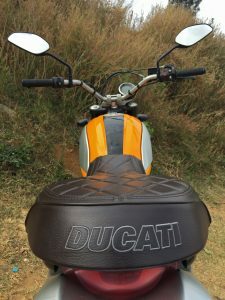 There comes a warning light when the fuel touches the 2 litre mark with which the bike would only run around 35kms.The rear end of the bike looks modern with the LED tail lights and the chunky Pirelli tyre giving it that go-anywhere attitude. There’s even a built-in USB charger under the seat to keep your devices topped up. All together the Scrambler is a head turner. 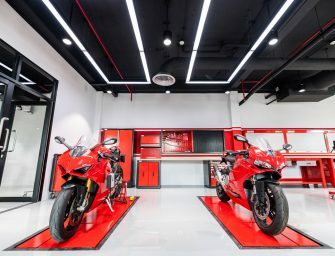 People fail to notice at first sight, but the strange yellow paint job and attractive design elements grabs everyone’s attention within no time and you will eventually build up get a fan club around when they see the Ducati logo on it. 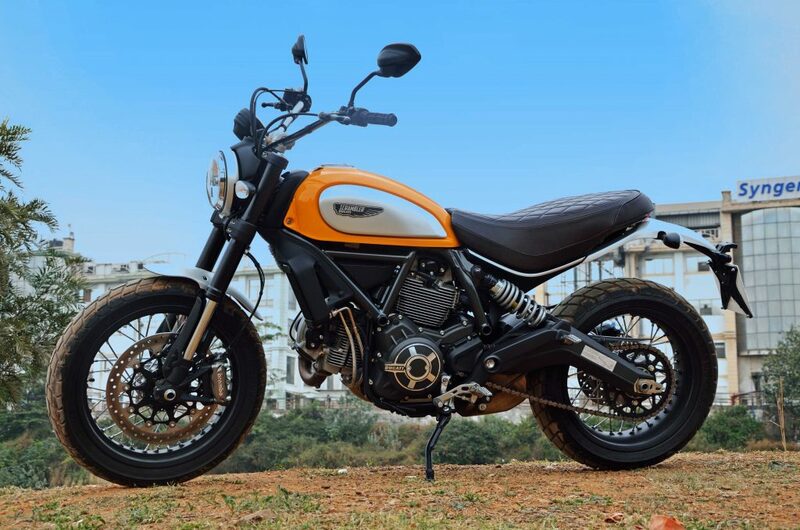 The Scrambler comes with an 803cc L-Twin air cooled engine which churns out 75bhp of maximum power and 68Nm of maximum torque. First of all, there is no radiator, and engine heat is unbearable during stop/go traffic – and once the vehicle starts moving, it’s all cool. Secondly, what we love is the torquey engine and the 6-speed transmission which makes it dead easy to ride in city traffic without much gear shifting. The bike hits 100kmph within 5 seconds and goes all the way above 150kmph without much fuss. 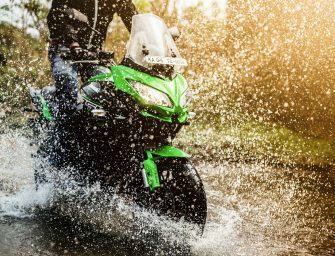 Top speed is said to be 190kmph but unfortunately because of the upright seating position, you will need to pull yourself closer to the tank at speeds above 150kmph to avoid falling off the bike. Also because of the flat seat, the pillion gets uncomfortable when you are riding it especially since there is nothing to hold on to. But apart from the small hiccups, it’s a great bike – and who wants to be carrying a pillion anyway? Two wheels can be enjoyed when we are left alone with the bike. It’s all about the person and the bike and in that case, the Scrambler scores pretty well. 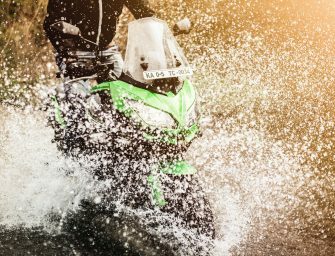 The go anywhere attitude and addictive handling make it easy to use on/off the road while the Pirelli MT60 tyres makes it a doddle to tackle corners as well as dirt. Apart from the good and bad things, I felt that the engine note should’ve been a little more ‘eargasmic’, just to add a bit more of the X-factor to the already fun-loving Scrambler. This Italian beauty is as beautiful and as simple as it is seen in the pictures. The kerb weight is 186kg which is as heavy as an RE Classic 500, but the weight is beautifully balanced. The seat height is around 800mm and it makes it quite easy to plant both the feet on the ground, and you can easily stand on the foot pegs and ride. About the suspension setup, the front comes with a 41mm upside down Kayaba fork and a side mounted adjustable Kayaba at the rear. 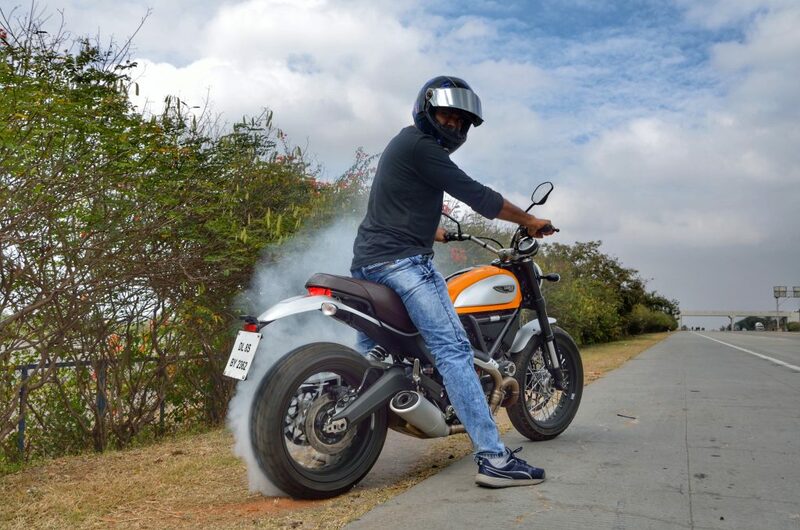 The Scrambler comes with ABS as standard which gives good confidence while braking; done through 330mm single disc at the front and a 245mm disc at the rear. Overall, the Scrambler is for those who need a classic styled modern entry level superbike with a go-anywhere attitude. I’ll admit I’ve had a bit of a thing for scrambler-style bikes since the beginning where I have even thought about customizing a 390 Duke into a Scrambler. 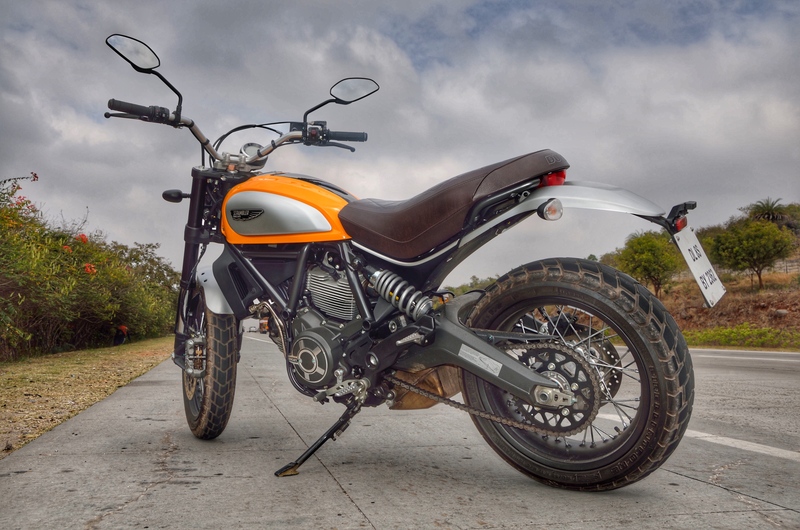 As mentioned, Ducati has a bike for all and those who are dreaming about owning a Ducati, the entry level Scrambler Icon starts at Rs. 7.09 lacs (ex-showroom) and the Scrambler Classic which we rode is at Rs. 8.32 lacs (ex-showroom). On our short ride we loved almost every bit of the bike, and altogether it’s a fun, potent little package!